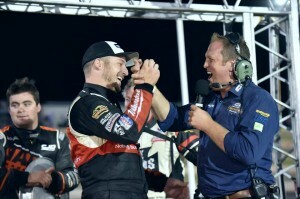 Monte Motorsports’ Kyle Hirst has claimed his first Enzed World Series Sprintcars round win in dramatic fashion as the left rear tyre of the Milwaukee Power Tools #17 exploded just 50 metres before he crossed the finish line. 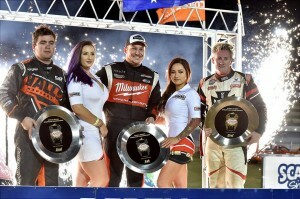 Hirst held off the Hoosier Hard Charger Steven Lines who raced from fifteenth on the grid to a phenomenal runner up result, ahead of Brooke Tatnell who started in ninth, Jamie Veal and Shaun Bradford. Just eight cars greeted the chequered flag after tyre degradation claimed a number of scalps including front runners, David Murcott, James McFadden, Luke Dillon and Jason Kendrick, while the remaining finishers all proved to be down to the final threads of their rubber to make it across the line, shining even more light on Hirsts miraculous victory. Luke Dillon cemented himself as a repeat offender in qualifying, claiming his sixth Revolution Racegear Quicktime for the season over Murcott and Hirst, but after heats and the Top 8 Shootout, started out of the third row beside Jason Kendrick. Jamie Veal was the early leader in the 30 Lap final but after three stoppages from separate incidents that included Callum Williamson, Daniel Harding and a collision with Ian Madsen and Lee Nash, Hirst pounced on the restart to get under Veal and extend his lead, before a nervous collision with Kye Scroop left the Hirst fans nervous as to whether the Milwaukee Power Tools entry at sustained any damage as immediately after, the race came to a stop for a single car rollover for Andrew Priolo with only six laps remaining. However the stars finally aligned for Hirst as his tyre exploded as he exited turn four on the final lap, crossing the line just three tenths of a second ahead of Lines and a further two seconds back to Tatnell in third. The touring circus now heads to Albany next Friday and Bunbury the following night, with Jamie Veal now leading the series by just five points over Brooke Tatnell, and a further 191 points back to Steven Lines. Fourth placed James McFadden’s title hopes received a terrible blow with his DNF leaving him now 379 points behind Veal and in the clutches of Murcott and Dillon in the battle for the minor championship placings. 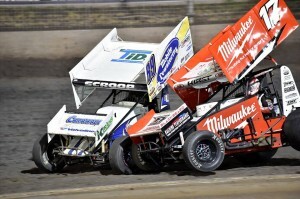 With its roots planted forever in the clay, now long gone from the old Windsor RSL Speedway the Australian Sprintcar Championship held it very first Championship race on Sunday afternoon at the Windsor RSL Speedway. 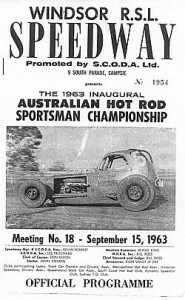 Life started out as the Sportsman/Hot Rod and in the passing years the category moved from Modified to Modified sprintcars before finally in 1979 to its current name as the Australian Sprintcars.The first Championship was won by Victoria Billy Willis over Ray Forrest and Graham McCubbin. The 2016 Championship will be the 54th time the Championship has been staged. 80 cars will be signed in the contest the three nights of racing and with 8 previous Champions in the field the winner picking the winner will indeed be a task. So many chances, Jamie Veal, Kerry Madsen, James McFadden and defending Champion David Murcott all have recent race wins that helps add confusion to the form guide. One thing can be guaranteed the winner will knon he or she has been in one hell of a race. With two nights of qualifying before the Championship night points will be the main aim in securing a favorable starting for Championship Feature. 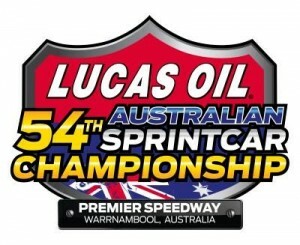 The Australian Sprintcar Championship will conclude an amazing two weeks of Sprintcar racing at Warnambool’s Premier Speedway.